Friday August 11 2017: Bill receives a surprise visitor, Steffy is puzzled by Sally’s attitude, and Katie and Wyatt’s flirtation is interrupted by Quinn. In Bill’s office, he reminds Liam he has feelings, and doesn’t appreciate his implication. Liam points out that ‘autoimmune disease’ isn’t a real diagnosis and suggests they call her doctor. Bill is forced to admit Caroline’s not really dying. Arguing ensues about what’s best for Douglas. Bill orders Liam to let it be. Liam is interested to hear why Caroline’s gone along with this, and asks what Bill plans to do when Caroline doesn’t die. Bill hollers about a miracle cure. He resents being called out by his son, who’s enjoyed a nice life on his money. Liam is stunned when Bill threatens to cut him off completely if he talks, and warns that Steffy will back him. Liam snarks – will he take back his DNA? Bill snaps that he doesn’t have enough of his DNA before apologizing. Things then turn grave as Bill warns Liam not to become his enemy. Later, Caroline takes Bill off guard by appearing in his office and announcing she can’t go along with this, even if it means losing Thomas. At Spectra, Steffy muses that Sally’s taking Thomas’ visit to Caroline really well, and asks, “Is there something you’re not saying?” She points out Spectra won’t last long without Thomas, especially with an upcoming showing. Sally know she thinks she’s a no-talent hack, but her brother doesn’t. Steffy suggests she close up shop and warns Bill is breathing down her and CJ’s neck. She offers to write Sally a recommendation for the fashion institute so she won’t go back to being a knock-off shop. Sally insists Thomas will return to her as soon as he able. At Forrester Creations, Wyatt and Katie canoodle as he teases about being friends with benefits and wonders if Christmas will come early this year. Katie supposes he’s one of those kids who wanted to open his presents early. As they flirt, Quinn enters suddenly. Wyatt moves away from his crush and chortles, “Mom!” He launches into being happy for her about reconciling with Eric, noting that she normally doesn’t fix what she breaks. Quinn asks what they were discussing. Wyatt says he was telling Katie patience is overrated. Quinn wholeheartedly agrees. Wyatt shoots a triumphant look at Katie. As they banter, Quinn wonders why Wyatt’s there, and notes he’s acting very chipper. She insists he stop bugging Katie and suspects he has designs on an intern. After Quinn leaves, Wyatt tells Katie it would have been hilarious had she figured out what was going on. Katie reminds him how much Quinn dislikes her and refers to their ‘illicit flirtation’. Wyatt giggles at the term, confirms he won’t tell his mother, and they make out. 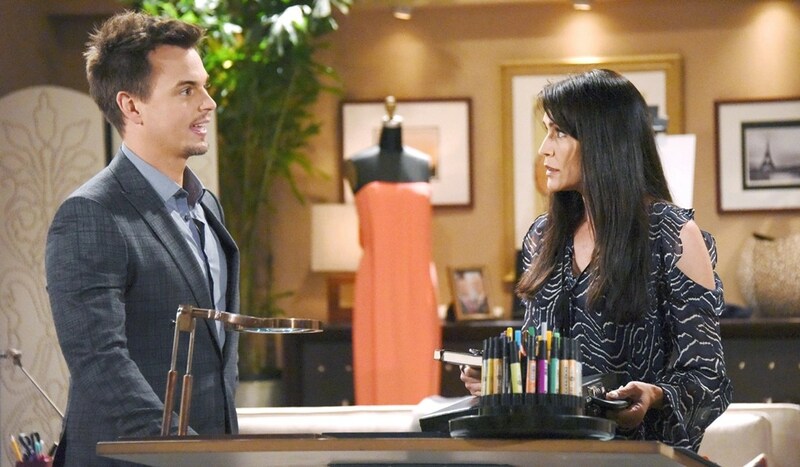 Later, Liam joins Steffy in her office and reveals the details of how Bill duped Thomas. Steffy wants to think it through as Liam protests that Thomas deserves to know the truth. Eric talks to Sheila about her plans.